A canton in northern Switzerland, formerly the only one in which Jews were permitted to live. The two townships Endingen and Lengnau, situated in the district of Baden and about three miles apart, formed for several centuries the Swiss ghetto. In the seventeenth century, or probably at an earlier period, when the Jews were banished from the confederation, several Jewish families were collected here under special protection as "Schirmund Schutzjuden." They were, however, forbidden to buy land or to own houses, and they were not permitted to live under the same roof with Christians. The gulf separating them from the Christians was further widened in 1671, when a special oath was formulated for all Jews who appeared in the court of justice (see Oath, Jews'). The Jews were also heavily taxed. The authorities, who renewed their charter every sixteen years, received pay for protection. The provost and the district clerk and his secretary received "recognition money" and "settlement dues"; and whenever the Jews passed through a locality in the canton they paid a polltax. In 1712, when the Jews at Lengnau were pillaged by the country people, the former had their charter renewed for sixteen years, and again, at its recurrent expiration, in 1728, 1744, and 1760—on the last occasion even in spite of the subprovost's urgent demands that they be banished. The renewal of the charter to the Jews in 1760 was granted only upon the express condition that "they should not multiply nor allow marriages between poor persons, and that all brides from without should bring with them a dowry of at least 500 gulden"; but there was the further restriction that "they could neither acquire houses, nor practise usury, nor buy estates, nor discount notes, without the permission of the authorities." 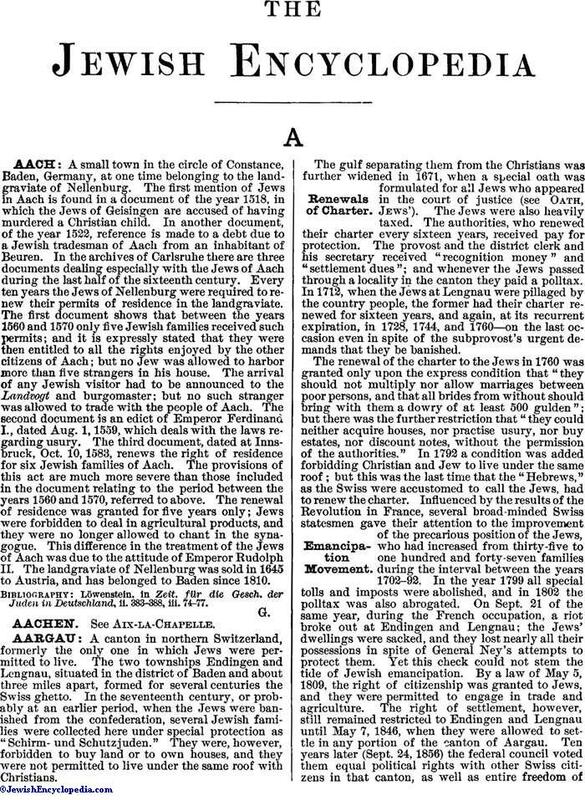 In 1792 a condition was added forbidding Christian and Jew to live under the same roof; but this was the last time that the "Hebrews," as the Swiss were accustomed to call the Jews, had to renew the charter. Influenced by the results of the Revolution in France, several broad-minded Swiss statesmen gave their attention to the improvement of the precarious position of the Jews, who had increased from thirty-five to one hundred and forty-seven families during the interval between the years 1702-92. In the year 1799 all special tolls and imposts were abolished, and in 1802 the polltax was also abrogated. On Sept. 21 of the same year, during the French occupation, a riot broke out at Endingen and Lengnau; the Jews' dwellings were sacked, and they lost nearly all their possessions in spite of General Ney's attempts to protect them. Yet this check could not stem the tide of Jewish emancipation. By a law of May 5, 1809, the right of citizenship was granted to Jews, and they were permitted to engage in trade and agriculture. The right of settlement, however, still remained restricted to Endingen and Lengnau until May 7, 1846, when they were allowed to settle in any portion of the canton of Aargau. Ten years later (Sept. 24, 1856) the federal council voted them equal political rights with other Swiss citizens in that canton, as well as entire freedom ofcommerce; but the opposition of the Christian population prevented the decision from being generally carried out. In 1860 the government of Aargau seriously considered a bill granting full enfranchisement to the Jews, the intention being to give them suffrage in all communal and cantonal rights, and to constitute the communities of Endingen and Lengnau autonomous villages. This bill was strenuously opposed by the Christian population, and led to serious disorders which threatened Jewish property. Notwithstanding the violent opposition of the Ultramontane party through its press, the government bill was carried May 15, 1862, by a vote of 113 to 2. This law should have become operative on July 1 of that year; but the dissatisfaction having become general throughout the canton, the law was repealed by a referendum. Jewish emancipation now became a federal affair, and was submitted for decision to the federal council. The federal authorities in July, 1863, granted the Swiss Jews the fullest rights of citizens, a result due largely to the efforts of the Swiss Jewish "Kulturverein" (Culture Society), founded in 1862 and dissolved after an existence of twenty years. Full civil equality was obtained only when they received the formal rights of citizenship, which had long been withheld from them in their own communities of Endingen and Lengnau. A resolution of the "Grosse Rath" of Aargau, May 15, 1877, granted citizens' rights to the members of the Jewish communities of those places, giving them charters under the names of New Endingen and New Lengnau. The prohibition against the Jewish mode of slaughtering, which by a plebiscitum became the law of the canton (see Switzerland), bore especially hard on the Jewish communities of Aargau. The civil, intellectual, and religious life of the Jews in Aargau differed little from that in other countries. For a long time the Swiss Jews were not allowed to bury their dead in Swiss soil. Their burialplace was an island in the Rhine near Coblenz (Switzerland), which is still called Judenäule, or Jews' Isle, bought for that purpose from the community of Waldshut, in Baden. It was only about the middle of the eighteenth century that they received permission to acquire a joint cemetery situated between Endingen and Lengnau, which has been in use ever since. The first synagogue was erected at Lengnau in 1755, it being the first on Swiss soil after the general expulsion; and nine years later the congregation of Endingen had the satisfaction of assembling in their own house of worship. After a lapse of ninety years beautiful synagogues were erected in both communities. In 1810 considerable funds were collected for the maintenance of communal schools, which were put on an equal footing with those of the Christians in 1835 and subsidized by the government. Originally one rabbi served both communities. The first one mentioned Loeb Pinschow, is buried with his wife on Jews' Isle. He was succeeded by Jacob ben Isserle Schvaich. Toward the end of the eighteenth century Raphael Ris, surnamed Raphael Hagenthal, was appointed rabbi of the two communities. He died in 1818, and was succeeded by Isaac Luntschütz, surnamed Isaac of Westhofen, who held the office but one year. His successor was Raphael Ris' son, Abraham Ris, previously rabbi at Mühringen. After a lapse of three years a conflict arose between the two communities, which was settled by the government's appointing Abraham Ris rabbi for Endingen only and Wolf Dreifus for Lengnau. The subsequent appointment of Leopold Wyler as rabbi of Endingen gave rise to grave dissensions in the community, which culminated in his retirement from office. The government issued a decree in 1853 regulating the appointment and the duties of the rabbis, and in 1854 Julius Fürst was elected rabbi of Endingen, but resigned three years later. 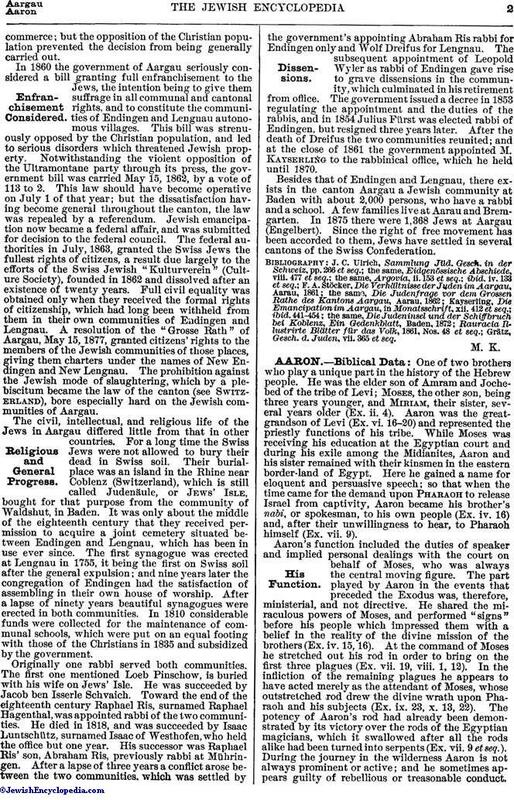 After the death of Dreifus the two communities reunited; and at the close of 1861 the government appointed M. Kayserling to the rabbinical office, which he held until 1870. Besides that of Endingen and Lengnau, there exists in the canton Aargau a Jewish community at Baden with about 2,000 persons, who have a rabbi and a school. A few families live at Aarau and Bremgarten. In 1875 there were 1,368 Jews at Aargau (Engelbert). Since the right of free movement has been accorded to them, Jews have settled in several cantons of the Swiss Confederation. Grätz, Gesch. d. Juden, vii. 365 et seq.